The written task 2 is a take-home assignment. This means that one is able to find quotes from the literary or non-literary works to support the arguments in the essay. This process of finding the right qotes, also known as 'quote hunting', is very important. If a written task 2 is not supported by illustrations from the primary source, it will not score well on Criterion B, which states that the response is supported by well-chosen examples from the text. 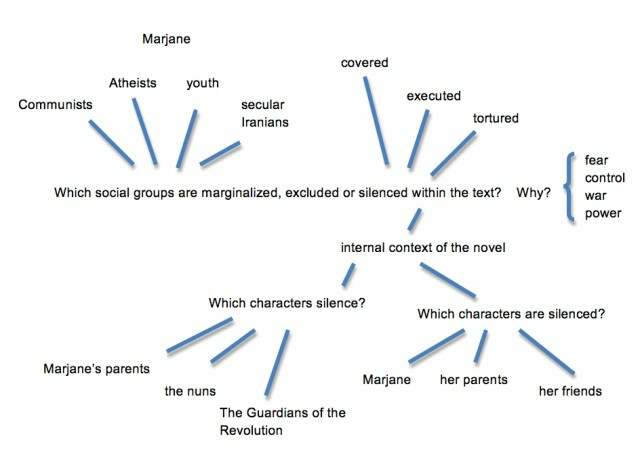 In this lesson, you can see how a literary work, in this case Persepolis by Marjane Satrapi, is used to lead the discussion and guide the essay. In the first step, you will gather important passages. In the second step, you will find an appropriate prescribed question. In the third step, you will go quote hunting again. You can see the final product of this lesson, by clicking on the link to WT2 Q4 S1 (Persepolis). 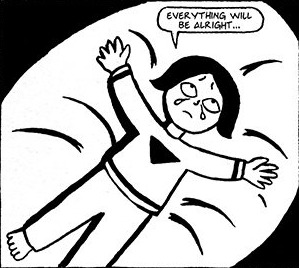 Imagine you have just finished reading the graphic novel Persepolis. Split your class up into groups. Each group must find the most important passage from the section of the work that you have been assigned. Explain to the rest of the class why you think your passage is the most meaningful from your section. Name at least one important theme that is illustrated in your passage. As a class you should be able to come up with a list of five important themes. What makes a theme 'important'? Below are passages that were taken from each section of Persepolis I. After reading these, what would you say are the major themes of the work? Once you know the themes of a work, you can begin to think about which one of the six prescribed questions is most appropriate. Based on your understanding of Persepolis from the passages above, which one of the six prescribed questions would you think is most appropriate? Once know which prescribed question you want to answer, create a mind map or spider diagram like the one you see below (also based on Persepolis). Once you have discussed the themes of the literary work, selected a prescribed question and unpacked the question. You will have to go back to the literary work and find more evidence to support the aspects that you want to focus on in the written task 2 critical response. How would these passages help support an answer to Question 4, as outlined in the spider diagram above? This notion of quote hunting may seem simple and it is. Nevertheless, students often do not spend enough time scanning an entire work, searching for the perfect passage to build their essay around. How does one develop this skill further? You readers are not always capable of teasing out the key passages from a literary work. This problem may relate to a general lack of life experience. For example, students do not remember the Islamic Revolution and the Iran / Iraq war of the 1980s, which Persepolis so poignantly describes. It is therefore recommended to break down a novel or text into smaller chunks, assigning each chunk to an expert group. This can be done chapter by chapter, as suggested in this lesson plan, or it can be done according to theme. One group could look for passages on 'coming of age', while another looks for passages on 'punishment'. Giving students a narrower focus on a text helps them sift out the relevant lines from the irrelevant lines. The trick with the prescribed questions for the critical response may not be so much as what to include, but what to leave out. Giving the essay a tight focus will help students answer the question (Criterion B). Notice how this exercise went from a general session of quote hunting (Important themes) to a specific purpose (an appropriate prescribed question). Written task 2 - Be sure to read the sample student response on Persepolis which came out of this lesson on quote hunting.